Topics: Adlard Violins, Uncategorized, About Us, How To Buy, Prices, and Violins. It is hosted by Layered Technologies Inc (Texas, Plano,) using nginx web server. 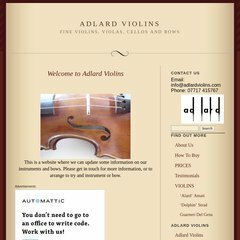 Adlardviolins.wordpress.com's server IP number is 72.233.2.58.